ERIN A. RENEGAR was born in Bixby, Oklahoma, and attended the University of Oklahoma College of Law on an academic scholarship. She competed on multiple trial advocacy and arbitration teams throughout the country and was awarded the Moot Court Speaking Award for excellence in oral advocacy. Ms. Renegar was selected as a judicial clerk for the Honorable Charles Johnson on the Oklahoma Court of Criminal Appeals in 2005. Since receiving her degree, Ms. Renegar has worked primarily in medical malpractice defense, including the defense of hospitals, physicians, nurses, paramedics, long term care facilities, nursing homes and assisted living centers. 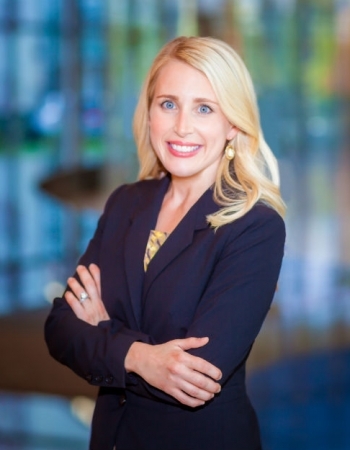 She has vast experience representing health care professionals and is a regularly featured speaker on issues such as informed consent, health care proxy, medical charting, dealing with disruptive patients, and deposition strategy. Ms. Renegar's practice also includes employment law and product liability litigation. Ms. Renegar also has experience first chairing catastrophic injury claims as lead counsel. Among her achievements, she has been selected by her peers to the Oklahoma Super Lawyer “Rising Star” list in 2010 & 2012. Ms. Renegar is a board member of the Oklahoma Association of Defense Counsel, and an active member of the American Board of Professional Liability Attorneys, the Oklahoma Bar Association, the Oklahoma County Bar Association, and the Defense Research Institute. Ms. Renegar resides in Oklahoma City with her two children.